Thank you Ruthie for this bday gift! 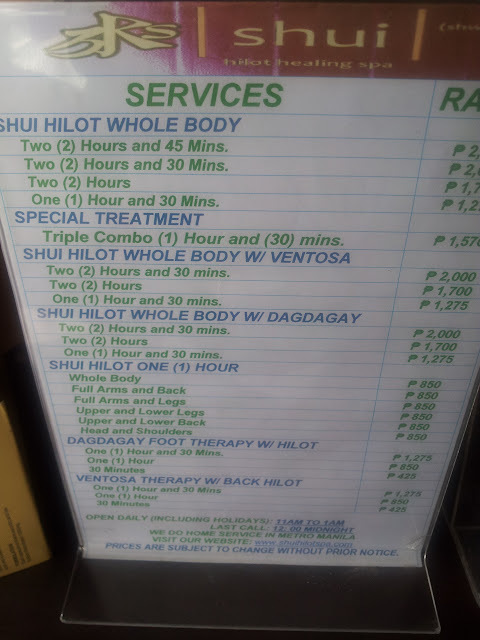 345P instead of P1380 for a 90-min Shui Hilot with Ventosa Cupping and Dagdagay. I just received my very first whole body massage in a massage spa last Saturday…and quite honestly, it wasn’t the best (and not the worst either) experience…if anything, it was a bit traumatic. Charooot! Seriously, it was just a so-so experience. It’s not something I’ll look forward to doing again. Mas gusto ko mag masahe si Inday, my kid sister, esp. when she’s mad haha because I can really feel my whole body react to her every palo, kurot and reklamo. Ok, I’m not really used to body massage, so parang I’m not in the position na mag-inarte diba lols…but I definitely know how to differentiate a good service from not. Ok again, it wasn’t that bad…it just didn’t meet my expectations na hindi naman masyadong mataas. We arrived 15mins late bec we haven’t printed our vouchers yet, buti na lang Ruthie called Shui first to adjust our schedule. Mimi arrived a little later so nabawasan yun 90mins nya. So make sure you come on time when you place your reservation, otherwise, mababawasan yun time nyo. I’m not complaining, I think this is actually nice esp. when there’s a lot of people in queue. First thing I tried was Ventosa Cupping. – those little bottles + candle placed on your back to suction all the “lamig” in your body. It looked non-sense sa picture…it wasn’t that bad but for 2 days, my back hurts. 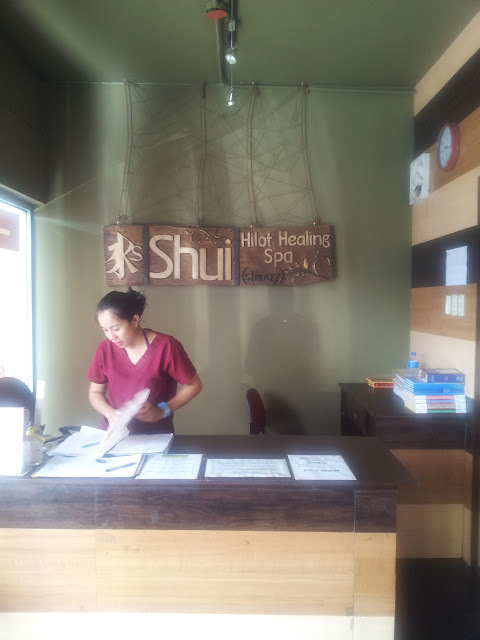 Then Dagdagay – foot hilot therapy. Nothing extraordinary here. Just some pinching and pressing your talampakan. My only worry is my toe injury I incurred in Davao last 2009. My tolerance to pain is sometimes very low…esp. when it comes to this part of my body. One time while having a foot spa, I forgot to inform Ate abott my injury so she pulled my toe and I collapsed! OA OA OA!!! I screamed in pain, it hurts so bad, I thought she pulled my left index toe out of my foot. Then the whole body hilot which was more like HILURIN MO LIKOD KO. Hahaha. But I think that’s the traditional hilot talaga…yun hinde masyadong masakit. Lastly, head massage that only made my hair looked greasy with baby oil. Ampanget because I looked really really haggard! Unlike other spas that I’ve visited in the past, the interior lack some ornaments/decorations. Ang arte-arte ko lang di ba hehe. It just doesn’t look very inviting. Yun lang naman. It lack that minty fresh aroma that’s sooo addicting. Yung parang VICKS! 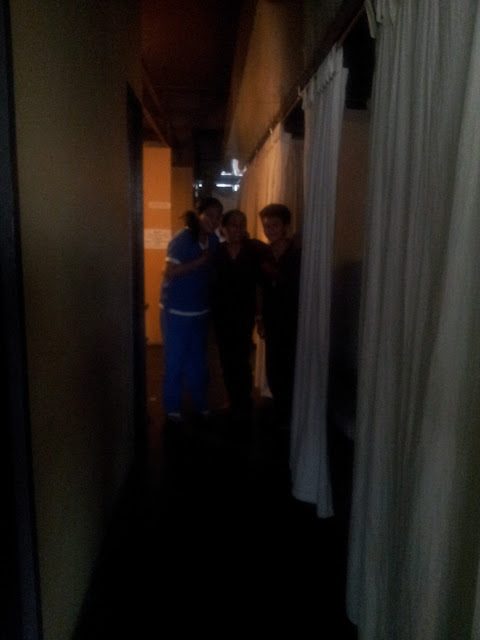 But the staff are really nice. Look, they’re very pricey! My verdict? It’s worth a try but just don’t expect a lot. 5/10 stars. Can I pull out my wisdom tooth myself?